If your looking Digital Tuesday Challenge 100th Blog Hop Post, click HERE. Hello! I have a card to show you that I made for The Hotspot Challenge. This month's challenge is called 'Channeling your inner Movie Star' and they want you to use one of Hallie Berry's dresses as your inspiration. 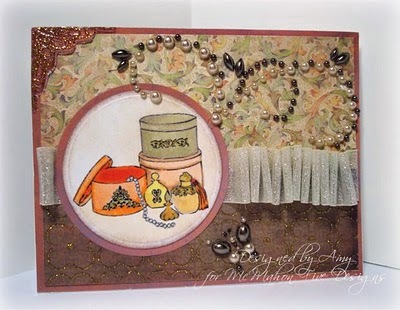 Simply pick a dress from the blog, and use an element from it (the design, texture, color, embellishments) for your card. It sounds complicated, but it's simpler than it sounds. Here is the card I made using a McMahon Five Designs digital image called "Feminine Perfection". The dress I was inspired by is pictured below, its in the first two pictures of Halle. I simply used a sparkly ribbon the same color as the dress and 'shirred' it like the top of Hallie's dress is. The paper is DCWV 'Once Upon a Time Stack'. The adhesive pearls are from Prima. I used a gold spica pen on the image, but it didn't show up in the photograph. It's very sparkly in real life. And here are just some of Halle's beautiful gowns. There are more on The Hotspot Blog for you to look at it. We hope you have time to play along this month! Beautiful card, Amy! Very well done! In my next life, I want to look just like Halle Berry - she is SO pretty! Great card - thanks for sharing! Amy, your card is simply delightful. What an awesome take on a great challenge. Thanks so much for stopping by my blog and leaving sweet comment. I have nominated you for the Stylish Blog Award. Check out my blog to see how to pay it forward. I love the Prima line! Pretty card! Oh, Amy...that is so pretty, and I can see the gold just fine....though I'm sure it's much more stunning IRL.